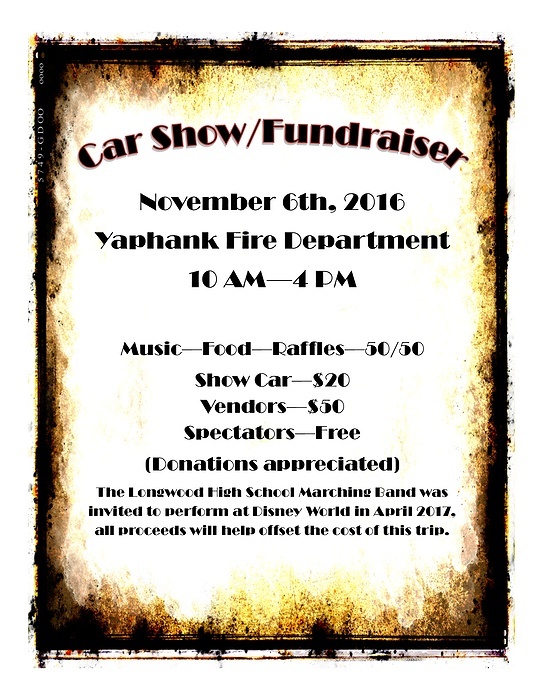 Subject: LongIsland.com - Your Name sent you Event details of "Car Show/Fundraiser to Benefit the Longwood High School Marching Band"
Car Show/Fundraiser at Yaphank Fire Department, November 6th at the Yaphank fire department from 10 AM to 4 PM. There will be music, food, raffles, 50/50s. Any type of car (or bike) is welcome. Spectators are free but donations will be greatly appreciated. The Longwood HIgh School Marching Band was invited to perform at Disney World in April 2017, the proceeds from this show will help offset the cost of the trip.